Patricia’s background is in Nursing, beginning with her training in Whiteabbey Hospital in 1967, working in the same profession in both the Ulster and Royal Victoria Hospitals until 2005. In 2007 Patricia began her second career as a Health Service Chaplaincy Volunteer. Patricia attended the Lay Hospital Visitors’ course at Edgehill College in 2009, and was then employed by Belfast Trust as Catholic Lay Chaplain shortly after. 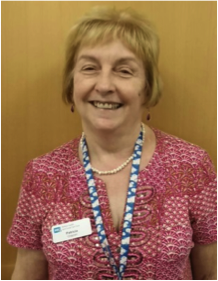 Patricia has continued to pursue continuous professional development undertaking courses within the trust and also taking part in a unit of Clinical and Pastoral Education (CPE) in 2012, and has recently attended the CPE refresher conference in March 2016. Patricia is married to Brendan and has been a member of St Gerard’s Parish on the Antrim Road for the past 42 years. Patricia works as part of an interdenominational team within the RVH Group of Hospitals, with special responsibility for Paediatric Chaplaincy in the Royal Hospital for Sick Children. She has many interests which include: gardening, reading, trying out new restaurants and spending time with friends. Patricia is an invaluable member of the RVH Team.